Guardians of the Galaxy Vol. 2 is even better than the first Guardians of the Galaxy. That’s an astounding thing to say because the first one was such an enjoyable movie, but it’s true. Everything the first one did right, the second one manages to improve upon. I can’t wait to see it again, which is high praise. I want to share 12 things I love about Guardians of the Galaxy Vol. 2. I don’t want to ruin anything for anyone who hasn’t yet had the pleasure of watching this, so I’ll keep my statements fairly general. But those of you who have seen it will no doubt enjoy revisiting these moments from the film. 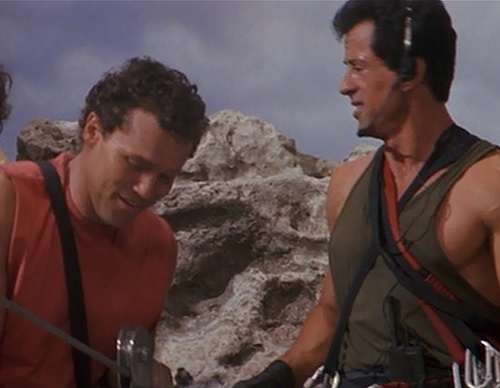 It was fun to see Michael Rooker and Sylvester Stallone share the screen again after all these years. They first appeared together in 1993’s Cliffhanger. In that film, Rooker was angry with Stallone through most of the film. But in Guardians of the Galaxy Vol. 2 their roles reverse and Stallone now spends most of the film bitter against his old friend. I don’t know exactly what part Stallone will play in the Marvel Cinematic Universe, but his presence in this film was a welcome addition. Yondu steals this movie. Everyone is great in it, but it’s Yondu who elevates the movie into something really special. We learn some things about him that answer so many questions from the first film. Why does he smile at the end when he learns that Peter Quill double-crossed him? Why is he so obsessed with finding Quill in the first place? Why does he treat Quill so angrily in front of his men? And why didn’t he deliver Quill to his father, as he was hired to do? The answer to all of these questions is the same. I had an inkling in the first film, but the second film makes it explicit. And it’s wonderful. 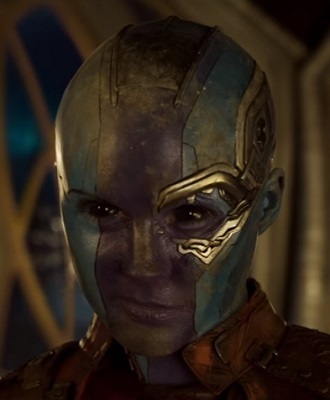 The first time I saw Guardians of the Galaxy I thought that Nebula was the weakest part. She came across as angry for no reason and she had a screechy voice whenever she would shout orders or threats. But, just like Yondu, she gets an interesting backstory in the sequel that suddenly turns her into a much more sympathetic character by the end. Now I don’t find her nearly as annoying in the first film. She’s a tragic figure, and I wish she wouldn’t have to suffer any more than she already has. Like many great sequels (such as The Empire Strikes Back, Aliens, or The Godfather, Part II) Guardians of the Galaxy Vol. 2 adds a whole new layer to the first film by giving the audience information that we didn’t know while watching the first film. This new information tells us that there was a lot happening behind the scenes that we couldn’t have guessed. But now that know, it changes everything. We can go back and watch the first film with a whole new perspective on the characters and their seemingly bizarre choices. Everything makes more sense now. Nebula and Yondu are astonishingly likable characters now. 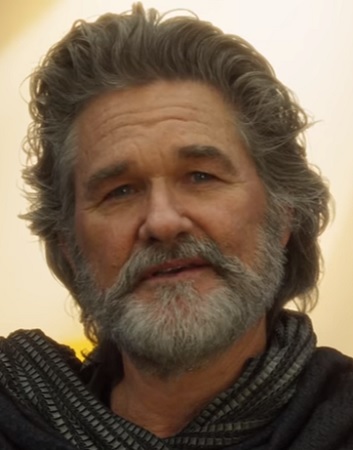 As soon as I finished watching Guardians of the Galaxy Vol. 2, I immediately wanted to go back and rewatch the first one. There is a brutal scene that lasts so long and kills so many people that I was kind of in awe of it. Commando, RoboCop, and other ‘80s action movies have nothing on Guardians of the Galaxy Vol. 2 in terms of the number of bad guys getting murdered. You’ll know the scene I’m talking about when you see it. It’s controlled chaos, and it’s perfect in its execution. Ego is an interesting character who pops up out of nowhere and complicates everything for Quill and his friends. I can’t say much more about him without giving everything away, but I’ll just say he’s a complicated individual who has understandable goals. I enjoyed all of his interactions with Quill, especially when he’s quoting lyrics to explain himself. 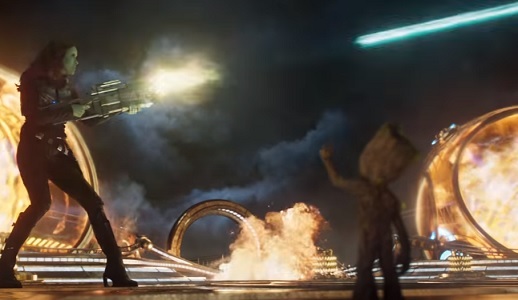 One of my favorite moments in the first film is the bar fight, which ends with Rocket the raccoon pointing a giant weapon at Drax the Destroyer. He’s drunk and extremely worked up over being called “vermin” and other names. The only way Quill is able to talk him down from killing Drax is by appealing to his self-interest of making tons of money. 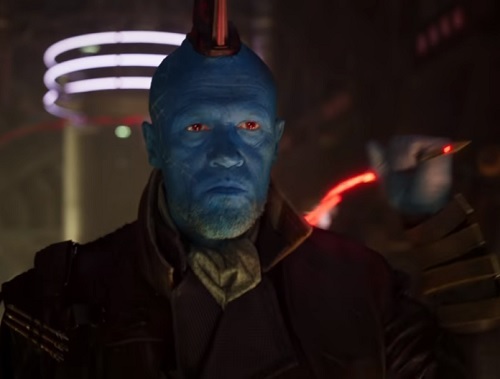 In the next film, there’s a somewhat similar scene in which Rocket keeps lashing out, but this time Yondu is talking to him. Yondu sees right through him and his pretense of toughness and sarcasm. 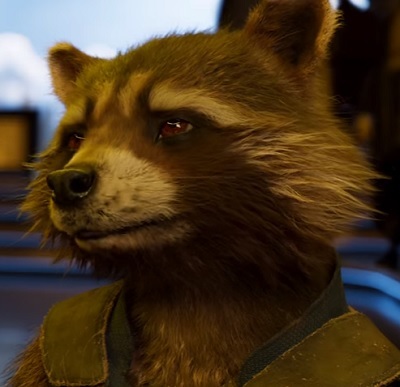 Rocket realizes a lot about himself in this revealing scene with Yondu. It’s so perfect. By now, we know what to expect from superhero action sequences. There’s some kind of monster or robot or multiple airborne threats for the heroes to take down, and we get to watch them do it in style. This film puts its own unique spin on that familiar trope. The opening and closing action sequences take the time to focus on Baby Groot for a good portion of them. At one point, it almost feels like we’re not going to see anything other than his perspective. But then the film relents and widens so that we do get the usual heroics from the usual point of view. It’s just so great that it takes the time to do something clever and fun with it. I also love the asteroid-field chase sequence. Once again, the film finds a way to do something new instead of copying The Empire Strikes Back. Quill and Rocket’s back-and-forth, trying to one-up each other on their piloting skills cleverly adds suspense to an already-tense scene. 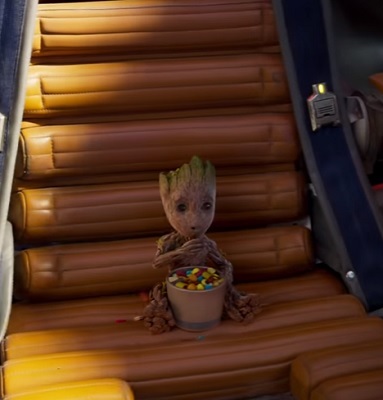 I am so glad that James Gunn decided to commit to the idea of having Baby Groot in this film. It wasn’t just a throwaway joke at the end of the first film, but a sustained running gag that works perfectly in the sequel. My favorite scene of him is the one where he tries over and over again to retrieve the right object to help his friends escape their jail cell. It goes on forever, but it just keeps getting funnier. It actually ends in a surprisingly emotional way, too. Groot is put to perfect use in this movie. 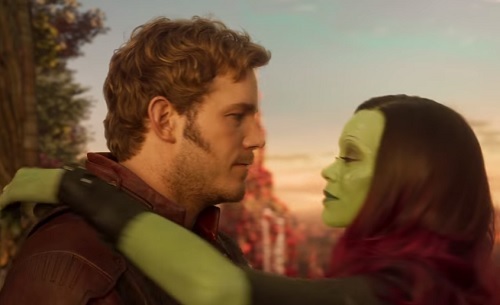 The love story between Quill and Gamora is handled perfectly. 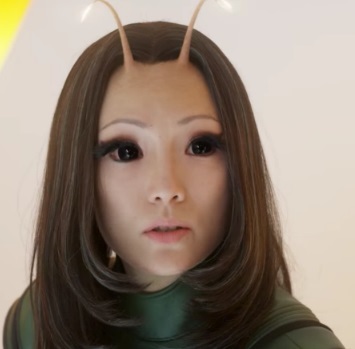 It follows the idea that the first one began about Gamora being a warrior, not a dancer, to its logical conclusion. And it says a lot by leaving so much unspoken between them. It has a very Han Solo/Princess Leia feel about it, but it’s also its own thing, which I love. The Collector’s assistant in the first film barely gets two scenes of character development before she explodes in a ball of purple fire. The sequel actually lets us spend more time with Ego’s assistant and it gives her quite a bit of depth. She’s sympathetic because she’s so childlike and innocent. She has a very Counselor Troi vibe with her empathic ability. But she also has a painful secret that she’s hiding, which just makes her that much more interesting. Guardians of the Galaxy did a masterful job inserting pop-culture references. And this one takes it up a notch. The songs are all expertly chosen, as usual. But the other references are right on point, too. Quill mentions the romance in Cheers when attempting to get past Gamora’s defenses. Then he puts Pac-Man to use in a brilliant way during a big battle scene. I laughed out loud at the Mary Poppins reference at the end of the film. Oh, and let’s not forget David Hasselhoff. Everything in Guardians of the Galaxy Vol. 2 is amazing. It’s rare to watch a movie that perfectly hits every note I want it to hit while also continually surprising me. It’s the sequel to Guardians of the Galaxy that I had no idea I was craving. It’ll be hard to top this, but I’m sure Marvel will find a way. This entry was posted in Random Stuff and tagged action movies, comic books, films, guardians of the galaxy, love, marvel comics, movie review, movies, relationships, science fiction, sequels. Bookmark the permalink. He is definitely awesome. It’s so much fun that they managed to make the character even more childlike and innocent than he was in the first one. So cute! You and me are possibly the ones who likes this movie more than first. I’m just glad you’re back! 🙂 Seriously, this is one of the best sequels I’ve ever had the pleasure of seeing.